Amber Simon (center) won the Golden Harvest Award for Best in Show at the 27th Medical Complex Art Show on November 1, 2017. 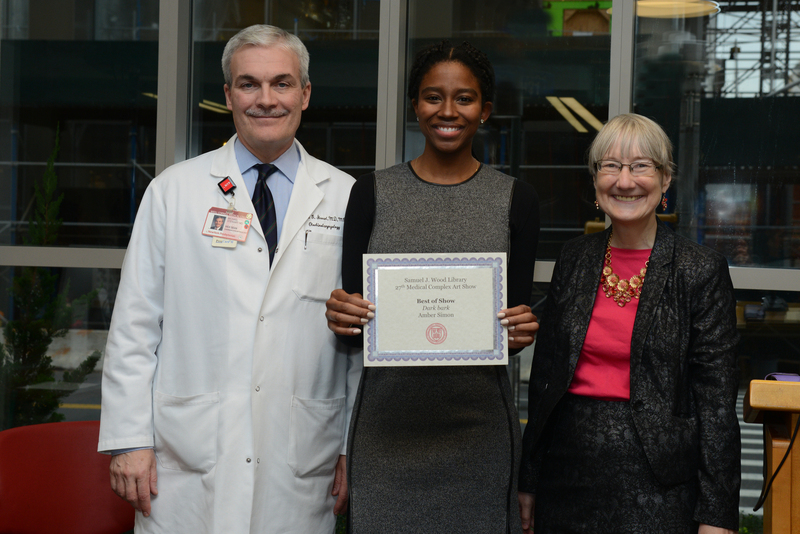 In above picture (left to right): Michael G. Stewart, MD MPH, Vice Dean of the Medical College, Professor and Chairman, Department of Otolaryngology - Head & Neck Surgery, Otolaryngologist-in-Chief, NewYork-Presbyterian Hospital/Weill Cornell Medical Center, Amber Simon ( 2017 Best of Show Winner), and Terrie Wheeler, Director, Samuel J.Wood Library and C.V. Starr Biomedical Information Center. Lynn Siemers, RN at NYPH - shown here October 6, 2016 with Terrie Wheeler, Director of the Samuel J. Wood Library & C.V. Starr Biomedical Information Center at Weill Cornell Medical College (R), and Dr. Augustine M.K. Choi, Interim Dean, Weill Cornell Medical College (L) - won the Golden Harvest Award for Best in Show at the 26th Medical Complex Art Show. Read More...Story Credit WCM Central. Students, staff and faculty members of our community devote a great deal of time and energy to the academic and clinical missions of their respective institutions. But that doesn’t stop them from pursuing artistic outlets too, as the stunning display at the 26th Annual Medical Complex Art Show at The Samuel J. Wood Library makes clear. The show, which also has a virtual component, comprises paintings, photographs and sculptures submitted by members of WCM, NYP, Hospital for Special Surgery, Memorial Sloan Kettering Cancer Center, and The Rockefeller University. This year’s Golden Harvest Award for Best of Show, went to Lynn Siemers, a staff nurse in the emergency room at NYP, for a painting titled “Pennsylvania Barns.” The Golden Harvest Award is named after a metal sculpture given to the library by Baron Charles Stepan, who brought art from his local artists' group into the new C.V. Starr Biomedical Information Center shortly after it opened in 1990. Dr. Amos Grunebaum, Henry Murad, and Alexander Marte Reyes were 1st, 2nd, and 3rd runner-up, respectively. Freddie Scott, an audio-visual technician at WCM, won Best of Show for the 11th Virtual Art Show with “Exposed #2782,” a beautiful black and white photo of the gnarled roots of a tree, shown below. Paul Jeng, Colin Haxaire and Marek Truchan were 1st, 2nd and 3rd runner-up, respectively. Dr. Augustine M.K. Choi, interim dean of WCM, officially opened the exhibit and presented the awards at a reception held on October 6. Artwork on display within the library is made up of a combination of works from art exhibitions and the library's permanent collection. Two to three art shows are hosted per year. Best of Show winners receive the Golden Harvest Award, named after a metal sculpture given to the library by Baron Charles Stepan. The Baron brought art from his local artists' group into the new C.V. Starr Biomedical Information Center shortly after it opened in 1990. The art calendar begins in the fall with the Medical Complex Art Show - displaying the works of faculty, staff and students of the Weill Cornell Medical College and Graduate School of Medical Sciences, NewYork-Presbyterian Hospital/Weill Cornell Medical Center, Hospital for Special Surgery, Memorial Sloan-Kettering Cancer Center, and Rockefeller University - with a virtual component including work from the Weill Cornell Medical College in Qatar and WCMC alumni. Works from members of local art groups are featured in the winter, spring and summer shows. Please visit our blog for announcements, and opportunities to submit work for upcoming shows. Exhibits can be continued for any period of time, from two months to six months (or more), as agreed upon by the library and the artist(s). The library organizes and hosts all art exhibitions, and approves the final selection of all artwork displayed. It is generally expected that art will be in place for the full duration of any given show; works will not be hung after the starting date and will not be taken down before the ending date. How Can I Get My Artwork Displayed in the Library? Students, staff or faculty members of the Weill Cornell Medical College and Graduate School of Medical Sciences, NewYork-Presbyterian Hospital/Weill Cornell Medical Center, Hospital for Special Surgery, Memorial Sloan-Kettering Cancer Center, or Rockefeller University can submit up to three photographs or slides for the Medical Complex Art Show. An annual "call for art" is issued in early fall. Individuals not affiliated with these institutions, but who are members of a local art group, are encouraged to contact the library about the possibility of a show. If you have questions, please contact contact Sherisse Brown: (646) 962-2562.